91 out of 100. Incorporating 20+ ratings and reviews. 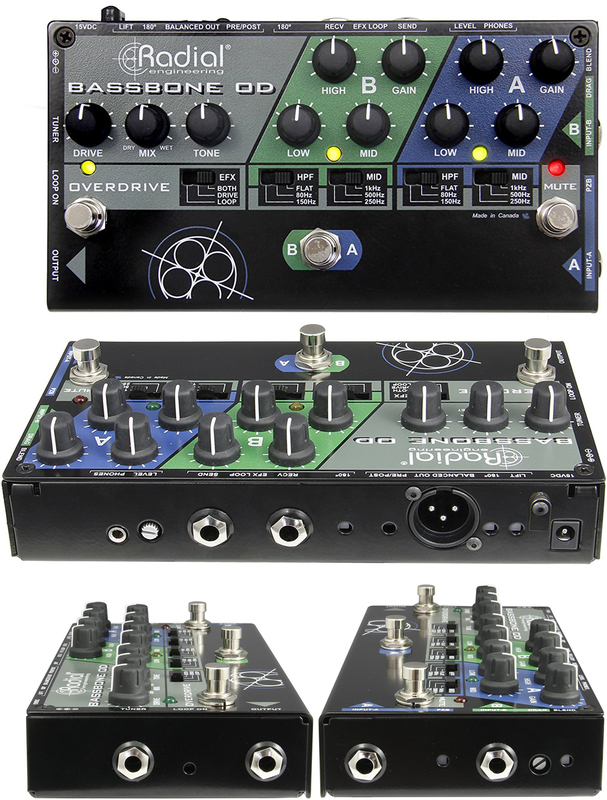 The Bassbone OD is a featured packed bass preamp from Radial Engineering, part of their long list of specialized DI boxes and preamps designed for different instruments. There are a lot of things you can do with this preamp, with two channels that allow for two sound sources, including piezo equipped acoustic and upright basses. It has dedicated EQ and Gain controls per channel along with other tone shaping knobs and switches. Connectivity options are also expanded including tuner out, headphone out, instrument out and FX Loop in/out. Bootsy Collins and Victor Wooten are just two of the many professional bassists that rely on Radial gear. Dimensions: 2.75" x 10.75" x 5"
Many users describe the Radial Bassbone OD as the quintessential "Swiss Army Knife" for professional gigging bassists, thanks to its dual channel design, Piezo Pickup friendly input, and tone versatility. The built-in overdrive was commended a number of times, especially by those who employ it subtly for tone enhancement. The unit's overall reliability and solid build also got a lot of thumbs up, with many describing it as a worry-free pedal. Nothing particularly noteworthy to report, other than a few who simply did not like the way the preamp colors the sound of their bass, which is more of a preference issue than a quality one. Get the Radial Bassbone OD if you're a multi-instrumentalist or you play both electric and acoustic/upright bass, however there are more highly rated options currently available which you will find in our guide to The Best Bass Preamps.